Who doesn’t love waffles? They are perfect for breakfast, brunch or even dessert. If you whip up a batch on Sunday morning, eat them for breakfast and freeze leftovers in a zip-top plastic bag, separated by layers of wax paper. When you’re ready to eat them, simply pop them in the toaster until they are warm. 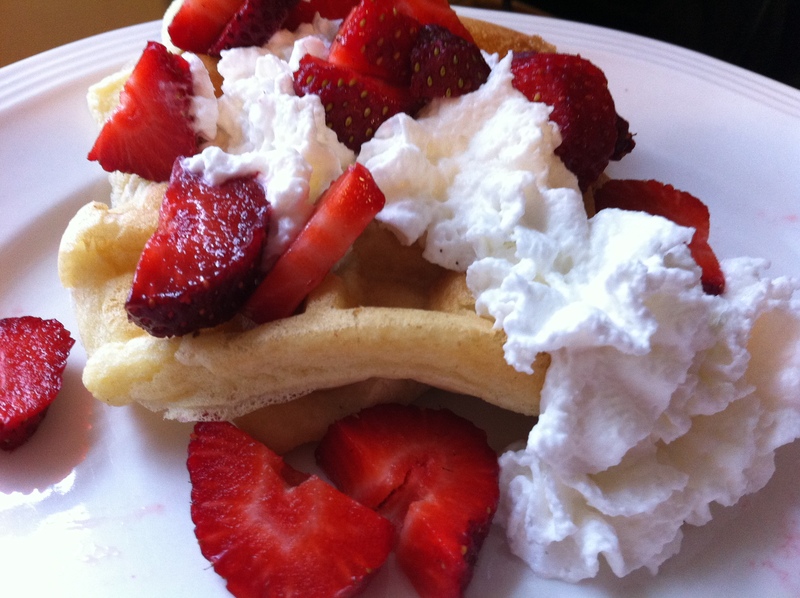 Then serve them with butter and maple syrup or as shown here, topped with sliced strawberries and fresh whipped cream. Yum! Beat egg yolks and sugar at medium speed with an electric mixer until thick and pale. Add butter and vanilla, beating until blended. Combine flour, baking powder and salt. Add flour mixture and milk to egg mixture, beating until smooth. Beat egg whites until stiff peaks form; fold into batter. Cook in a preheated, oiled Belgian waffle iron until golden. Serve with sweetened whipped cream and strawberries.